The Texas gas station empire Buc-ee’s has finally found its way to Denton, and if you’ve never been, it’s nothing short of an experience. 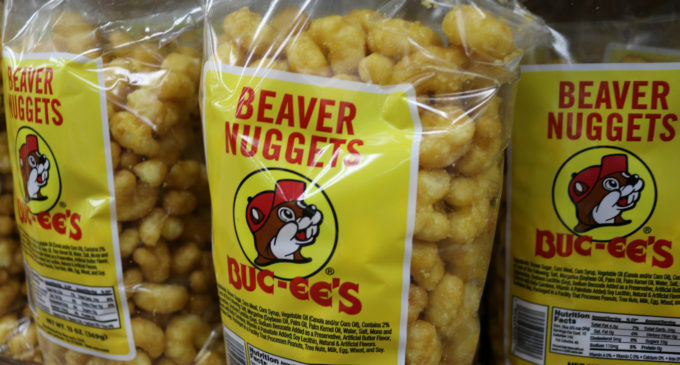 The tried and true Buc-ee’s classic, Beaver Nuggets are a light, caramel-flavored puff that are nothing short of addicting. Get a small bag for yourself or a bigger bag to share — either way, once you start eating them, it’s hard to stop. The best comparison I can make for the taste of Beaver Nuggets is to fluffy buttermilk pancakes with syrup. 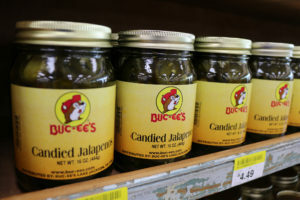 For an interesting snack for your next party, try a jar of the Candied Jalapeños poured over cream cheese. Serve with crackers and watch your party guests go crazy over it. They bring the perfect combination of sweet and spicy you can’t miss. The “Sizzlin’ Saltines” Spicy Crackers are savory snack your mom has probably found on Pinterest, but never got around to making. They practically dissolve in your mouth for a satisfying salty snack you can’t find in chips. 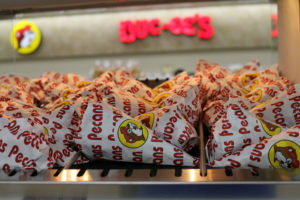 The beef jerky at Buc-ee’s is unmatched with the variety of flavors, from hot and spicy to bohemian garlic. You can find multiple walls worth of selection or a counter where you can get it by the pound. You can’t pass over the hot and spicy ones if you like great flavor and heat.